It is time to take a peek at what EssayServices.org has to offer. 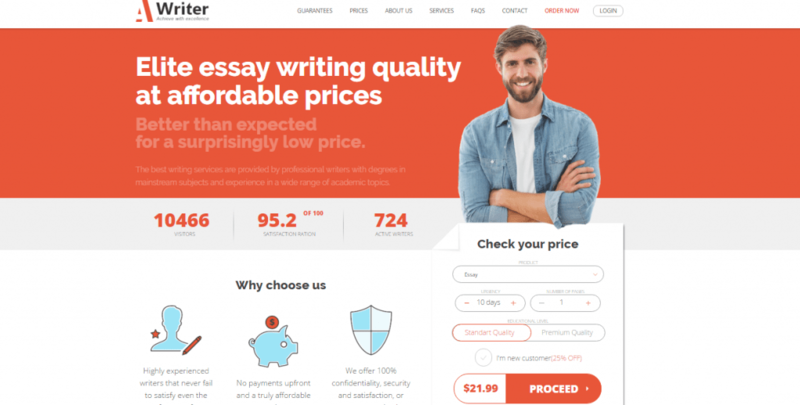 Being a reputable company that offers academic writing services, EssayServices.org has survived on the market for a long time now. Our review will give you a detailed view at their services, pricing and discounts, paper quality and customer support system. Read on. The services of this provider are separated in four main categories that can be found on the price page: writing from scratch, editing and proofreading, multiple choice questions and problem solving. When it comes to writing from scratch services, the company is mainly focused on essays, which allows it to offer various essay types. However, the remaining academic paper choices are only a few, including research paper, term paper, thesis and coursework. So, if you are looking for another type of academic paper, you may want to look elsewhere. The services EssayServices.org offers come for every academic level: undergraduate, Bachelor, professional and admission help. We did not find any information about what ‘professional’ really means, so we are not sure if this is PhD option or something else. Pricing is a bit of a complex matter with this service. We didn’t found any list of prices, but you can calculate it with a calculator. Also, if you want your paper to be written urgently, you have to pay extra more than twice. We found this a bit frustrating, since the company offers content of highest quality for every order. Does this mean that if you do not pay extra for editing, you will receive content with mistakes and errors? When it comes to discounts, the company does offer some inviting discounts. These are not discounts for new or returning customers, but discounts based on cost of the order. We’ve decided not to use their editor’s offer in order to check if the content really needs editing if you do not pay for it. With the taxes, the price of our paper remained low, which makes the company really affordable. However, the content did need editing, which only confirmed our suspicion that you will have to pay the extra fee for the editing option. The content received was of good quality, except for the few grammatical and vocabulary errors. The company’s contact information is listed in a separate page, together with their address. You can contact this provider on their phone number, e-mail address of 24/7 available live chat. We have tried the phone and the live chat and we were satisfied with the promptness and assistance of the representatives. Overall, EssayServices.org is a reliable service that offers good essays for affordable prices. We have found few costs that add to the price in the table and we were really unhappy with the editor’s option. Otherwise, it looks like a valid company with its main focus on essays.